PHOENIX — The official start of the boating season is nearly upon us and many Arizonans are getting ready to pull their favorite watercraft out from storage in preparation for more fun on the water. Registration – Make sure your boating registration is current. 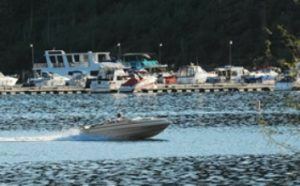 Those needing to renew their watercraft registration can do so 24/7 by visiting www.azgfd.gov and clicking on “Boat Renewals” or at their closest AZGFD regional office. Fuel system – Check the system for any leaks or damages. Give special attention to any fuel lines and connections. Damaged fuel hoses could either be cracked, brittle or soft. Also ensure the engine exhaust and ventilation systems are functioning properly. Before starting your engine, open the engine cover and smell for the presence of fuel vapor. Leave the engine cover off when first starting so you can inspect for proper functioning of the engine. Belts, cables and hoses – As with fuel lines, inspect all belts, cables and hoses that may have been damaged while in storage. Inactive items can become brittle and may crack. Ensure belts are fitted tightly and that there are no cracks on the outer jacket of the throttle, shift and steering control cables. Electric system – Inspect all electrical connections to ensure they are clean, tight and corrosion free. All electrical systems should be regularly inspected by a qualified technician. Fluid levels – Check all fluid levels including engine oil, power steering, power trim reservoirs and engine coolant. Also be sure to change the engine oil, oil filter and drive lubricants. Propellers and hulls – Ensure propellers are free of dings, pitting, cracks and distortion, and that they are secured properly. On the hull, inspect for blisters, distortions and cracks. Also make sure the vessel’s drain plug is in place before launching. Safety gear – Check to ensure all life jackets are still in good condition, that they are the right size and fit for your passengers. On average in Arizona, life jackets should be replaced every five years. Remember that state law requires anyone 12 and under must wear a life jacket at all times when the vessel is underway and there should be one life jacket aboard for every passenger.Don’t forget that a throwable flotation device – usually a cushion with handles or a ring buoy – is required for all watercraft longer than 16 feet, except for canoes and kayaks. Also check to ensure the fire extinguisher is fully charged and stowed in the proper location.